Democrats on the House Intelligence Committee released examples of Facebook ads paid for by Russian actors during this afternoon's hearing with Facebook, Google and Twitter. Ads were displayed in the hearing room to drive home their concern about foreign governments "weaponizing" social media content. The details: According to the metadata attached to the ads, they targeted both Republicans and Democrats and were paid for in rubles. 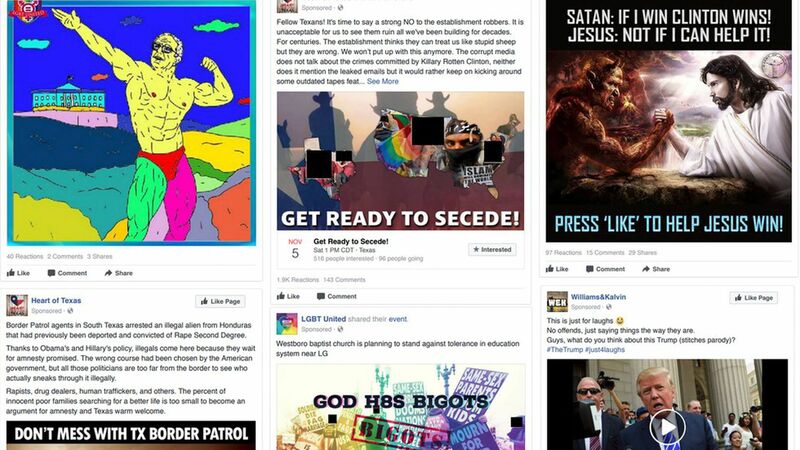 The ads were intended to stoke discord on divisive issues such as religion, racial issues and immigration. Facebook's chief lawyer said Wednesday afternoon that the company had not found overlap between the targeting used by Russian trolls meddling in the 2016 election and the Trump campaign. His remarks were in response to questions at the third hearing of the last 48 hours for Facebook, Twitter and Google on how Russia-bought ads and content spread on their platforms. "We have not seen overlap in the targeting that was relatively rudimentary used in the [Russian troll farm Internet Research Agency] ads that we've disclosed and any other advertiser that's been operative on the site, including the Trump campaign," said Facebook General Counsel Colin Stretch. Twitter and Google didn't provide definitive answers. Go deeper: Politico breaks down the individual ads with corresponding specifics of when they ran, where they were targeted, and how many people saw them and clicked on them. What's next: Lawmakers have pushed the companies to make more information about the foreign-bought ads public. House Intelligence Committee leaders plan to release the Russian-bought ads that appeared on Twitter and Google. The companies said they would benefit from the government sharing information with them as well in order to effectively identify inappropriate content and ads.